Carnegie heroes Brian R. Gadwell, left, and Steven A. Rauser, right, hold the Carnegie Medal while standing with Detroit Police Chief James Craig. 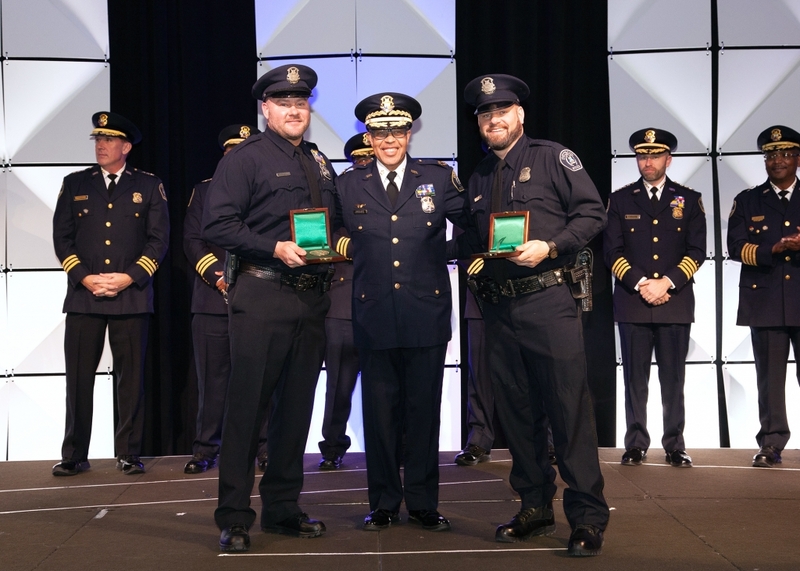 The two Detroit police offiers were presented with the Carnegie Medal Nov. 29 at Detroit Public Safety Foundation’s Above and Beyond Award Celebration, an annual dinner that honors police, fire, and medic personnel who go above and beyond the call of duty. The event was held at the Marriott at the Renaissance Center in downtown Detroit. In April 2017, Gadwell, 39, and Rauser, 37, both entered the frigid Detroit River to help keep afloat a 34-year-old woman who had fallen into the river from an area that had no easy egress. The panicked woman was passed from Gadwell to Rauser, who submerged several times before the woman disengaged from him. A nearby boat responded and removed the woman from the water. Emergency personnel lifted the officers from the water.